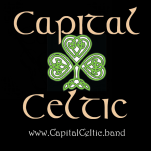 ARE YOU A DC AREA CELTIC MUSICIAN? We're always interested in meeting musicians interested in performing with us. We're especially interested in folks who play bodhran, button accordion, harp, bagpipes and hammer dolcimer, but if you're a fiddler, mando player, flute player, tin whistler, guitar or banjo player we'd love to talk to you too! Email CapitalCeltic@gmail.band or call 571-274-8718.